Saint Georges Channel is located between the eastern tip of New Britain and the west coast of New Ireland southward to Cape Saint George. Also known as "St. Georges Channel". Located inside is Rakanda Island. Today spans East New Britain Province and New Ireland Province in Papua New Guinea (PNG). 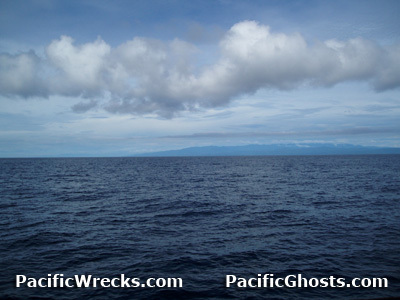 During the Pacific War, used by the Japanese Navy during late January 1942 as an important shipping channel that connected Rabaul the open sea and was the first leg for vessels departing southwards to the Solomon Islands. "For flights over Rabaul, we always looked for safety to St. Georges Channel because it was only a few minutes away to where you would start hitting thunder clouds. We would go into those thunderheads, something we would never do in the States, and go up... down mainly four or five thousand feet in the blink of an eye. But, the [Japanese] fighters couldn't follow us. Of course, with that kind of turbulence we were fighting for our lives too, just to stay in the air."